This is a shot taken from the garage of my home in Melbourne. The water made it to the lawns of my neighbors across the street and partly up the driveway of my place. Brian, a friend of former roommate Mark's, snapped a few photos of Grand Meadows Boulevard, the street-turned-river that runs by my house. 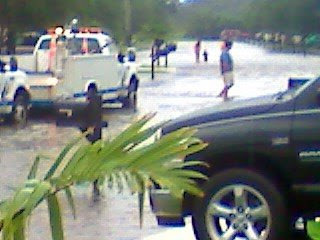 Tropical Storm Fay has dumped about 2 feet of rain in the area of north Melbourne. 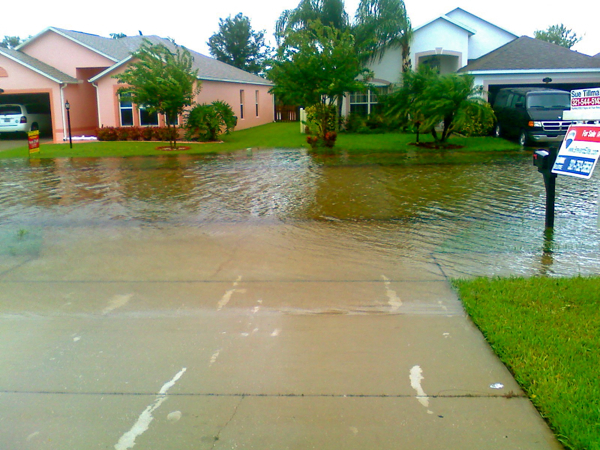 One of the hardest-hit sections is Parkway Meadows, the subdivision next door to mine, Baymeadows, where a man was photographed by FLORIDA TODAY surfing in the streets with floodwater to the hood of a car. I'm quite jealous of all those Brevardians in the county for the storm. I happen to be up in frigid Down East Maine. Today in Vacationland, it was only 72, but tomorrow should be 85 with clear skies. Mark tells me that the house is safe. Luckily, I brought all my expensive electronics with me to the Great North. But the more sentimental items, including newspaper clippings, are sitting on the floor of my closet in Melbourne, a place that is susceptible to water. Water was apparently creeping into the edges and corners of the house, soaking the carpet inside, but that's all. My precious belongings are safe. As I'm missing one of the biggest stories of the year for Brevard, I'm taking it easy in Maine, shooting video and photos of its natural wonder. There will be more on that later. I desperately need something to spice up The Offlede: It's boring without tropical weather.